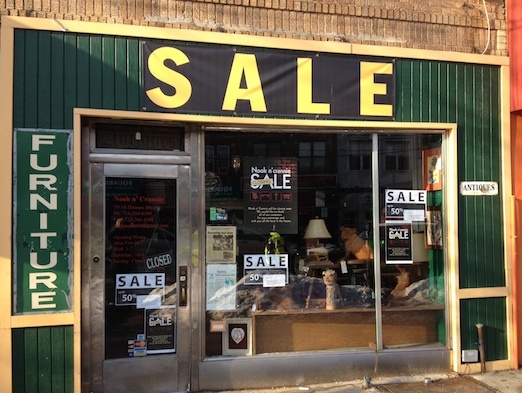 Astoria’s Nook n’crannie on Ditmars is closing and everything is 50% off right now. We first heard about this via a tweet from Astorian Max Falkowitz, and it was confirmed by a conversation on Astorians—Nook n’crannie, the nice antique/thrift shop, is closing. One theory is that they were offered a lot of $$ for the space (that would not be out of the realm of possibilities). Another one is by WHA reader TJT, “They said the foundation that represents them is moving all operations down south. There will be no more locations in the north.” That foundation is Betel of America, which helps those with substance abuse problems. We’re sorry to see them go! There were some pretty cool things in there, and their former LIC location also had some great furniture offerings. I purchased a few things over the years—they opened up in 2007. Everything is 50% off right now. We do wonder what will open up in that space when they’re gone, since so much is happening on Ditmars in general.